Sturdy steel ceiling hooks for hanging plants, signs, decorations etc. For hanging plants and lamps. Wrought iron hanging plant hook. Matte black powder coated finish. Holds up to 16" pot. Weight capacity: 33 lbs. For hanging plants and lamps. For hanging plants and lamps. Use to hang and position a variety of plants outdoors. Vinyl coated steel material with WeatherGuard protection to withstand harsh weather conditions. For hanging plants. 2.5" overall height and 1.42" depth. Includes 3 black, vinyl coated hooks. For hanging planters. Includes toggle bolts. 8 pound maximum load capacity. 6" black hanging plant bracket. For hanging planters. Includes toggle bolts. 8 pound maximum load capacity. For hanging planters. Includes toggle bolts. 8 pound maximum load capacity. For hanging plants or extender chains. Includes toggle bolt. Wrought iron hanging plant hook. Matte black powder coated finish. Holds up to 16" pot. Weight capacity: 33 lbs. For hanging planters. Includes toggle bolts. 8 pound maximum load capacity. For hanging plants or extender chains. Includes toggle bolt. National Hardware Suspended Hook, Series: V156, 10 lb, Ceiling Mounting, Steel, White, For Hanging Plants, Signs, Decorations in the Workplace Sturdy steel ceiling hooks for use on suspended ceiling track. For hanging plants, signs, decorations etc in the workplace. Easy to install. Includes 2 per pack. A highly durable steel material that adds a decorative and finishing touch to any room. For use on suspended ceiling track. A highly durable steel material that adds a decorative and finishing touch to any room. For use on suspended ceiling track. For suspended ceilings. Use to hang and position a variety of plants. Ideal for indoor use. Made from strong polycarbonate. 2 hooks per package. Designed to hook into ceilings. 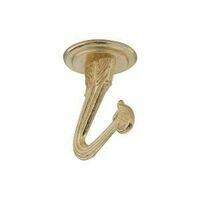 Decorative home hardware that adds a finishing touch to any room. Die cast material.